The Montreal Canadiens will honor Ken Dryden by retiring his No. 29. Ken Dryden's No. 29 will be retired in pre-game ceremonies Monday night at the Bell Centre and it's a well-deserved honor for the goalie who led the Montreal Canadiens to the Stanley Cup in six of his eight NHL seasons. There will be speeches, stories and tears and Canadiens fans will thrill to the sight of so many of their former heroes who are turning out for this historic night. Many good things will be said about this 59-year-old Hamilton native who played hockey at the highest level, authored important hockey books, had a successful career as an NHL team executive and is now one of the leaders of Canada's Liberal Party. Dryden will be remembered for many great moments and it would take a book to list them all. He'll certainly be remembered for changing the NHL's balance of power in his Stanley Cup Playoff debut. Dryden should thrill to read the words of one great hockey man who will not be there, one of those rare players whose accomplishments rival Dryden's. Milt Schmidt, 89, led the Boston Bruins to two Stanley Cups, played in two other Stanley Cup Finals, coached the Bruins to two more Stanley Cup Finals appearances and was the general manager of their Stanley Cup champions in 1970 and 1972. Schmidt has seen every good-or-better NHL goalie since breaking into the league in 1936. Schmidt and many other Bostonians will never forget their disappointment in 1971 when their team, one of the best regular-season teams in the history of the NHL, maybe the best ever, fell to the Montreal Canadiens and rookie Ken Dryden in the first round of the playoffs. No recent playoff collapse even rivals the humbling that Bobby Orr, Phil Esposito, Johnny Bucyk and the rest of their talented cast received from Dryden and the Habs. In fact, most Bruins fans consider Game 2 of that series, when the Bruins gave up a 5-1 lead and lost, 7-5, to be the most painful game in the history of the franchise. Schmidt has the true sportsman's attitude: He gave his best and the other team won, hats off. 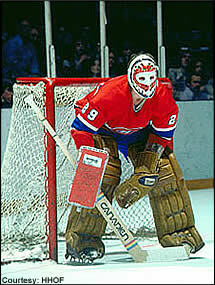 "Ken Dryden is one of the greatest goalies in the history of the National Hockey League," Schmidt said with emphasis. "There's no doubt about it. If I had to pick the best goalie I ever played with, it would be Frankie Brimsek. But of the goalies I've watched and never played against, Ken is one of the top goalies of all time." In Schmidt's day, goalies stayed on their feet or got sent to the minors. Jacques Plante, Glenn Hall and Terry Sawchuk, among others, changed that in the 1950s with their diving and sprawling and Hall with his butterfly style. But Dryden was a throwback who stayed on his feet and filled the net with his 6-foot-4, 205-pound frame. "He was one of the great ones due to the fact he didn't flop around," Schmidt said. "He was a standup goalie. That was the reason he had so much success. Ken played with great players and was responsible for the great years they had. "They're putting his number up in the rafters for all time," said Schmidt, whose own No. 15 hangs in perpetuity in the Bruins' arena. "It's a well-deserved honor to Ken. Believe me, he was one of the greatest ever." "Kenny got called up just prior to the closing date to be eligible for the Stanley Cup," recalled Jean Beliveau, the captain of the 1971 Canadiens. "Kenny won all those games and was great for us in the Playoffs. But in that second game at Boston, that famous game in Boston when we were losing 5-1 with two minutes to go in the second period and we came back to win, that's the game when he came to everyone's attention in the NHL. "Henri Richard scored at the end of the period. I got two goals in the first five minutes of the third period and we went on to win, 7-5. I always thought that game broke Boston's back because they had won pretty good, 3-1, in the first game." Dryden's success in the 1971 Stanley Cup Playoffs set up one of the most heartwarming moments in Stanley Cup history. The Canadiens the previous season had failed to make the playoffs for the first time since 1948. Beliveau had helped them win nine Stanley Cups in his 17 seasons but the Canadiens finished third in the East that year and it appeared Beliveau would end his career on a down note. Instead, the then-39-year-old leader was the most impressive skater in the playoffs and the memory of him joyfully carrying the cup at Chicago Stadium remains a lasting impression. "A lot of Boston fans got up the next morning, after having gone to bed after the second period, shocked to learn Montreal won," said Beliveau, who concluded his Hockey Hall of Fame career that year by leading the Stanley Cup Playoffs with 16 assists, among his 22 points. "I can still see clearly in mind, Phil Esposito standing near our net and shaking his head after a tremendous save by Kenny. "It stunned us too," admitted Yvan Cournoyer, who had 10 goals and 22 points in the 1971 Stanley Cup Playoffs and would win the Conn Smythe Trophy in 1973. "What a break for us! For a rookie, his confidence was amazing. We were a great team because we had a great goalie, which is the start of a great team. A lot of nights we didn't start the way we should and he kept us in the game." "I always thought Boston had as good or better team than we had but Kenny was so good during those playoffs, there's no doubt he made the difference," Beliveau said. "When you look at his record of six Stanley Cups in eight years, you know he was the best." "They were certainly a very strong team and they were just a very powerful offensive team and they knew it," Dryden recalled. "They knew they could score in all kinds of different situations. They had two very special players in Orr and Esposito. Those two made other players almost special, really good in a way that made them excited. They were scorers in minor hockey and juniors but never in the NHL and now they were big scorers in the NHL. A lot of their supporting players were over-the-moon energized and experiencing how much fun it was. The Bruins were a team that looked like they were having fun and they had a strong sense of themselves. "But every team has weaknesses and they had weaknesses," Dryden continued. "While they played a powerful offensive game, they left themselves vulnerable sometimes. But they didn't sense danger because, in other situations, they would give up a goal and come back with three. They had experienced that all season." 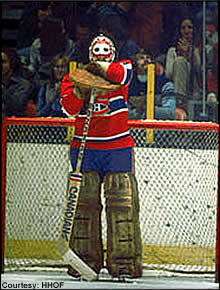 Dryden led the Montreal Canadiens to the Stanley Cup in six of his eight NHL seasons. The Canadiens were a good team but one in transition. Beliveau, Richard, John Ferguson, Terry Harper and Claude Larose were part of the old guard that had won Stanley Cups in the 1960s while Dryden, Guy Lafleur, Rejean Houle and Marc Tardif were rookies that season. They were not as dominant as they had once been or would be again later in the decade. "You look at our roster now and wonder why we were underdogs," Dryden said. "But a lot of our players were past their best years and others before their best years. Being the Canadiens, we always found our best. In the end, what happened was those who were past their prime found it one more time and those before their time found it for the first time. We didn't get as many chances as they got but when we had odd-man rushes, with players like Beliveau, Cournoyer, Lemaire and Lafleur, we didn't need two or three shots. They could score." The Canadiens defeated the Minnesota North Stars in six games, but left the ice to protests of Minnesota players and fans that a North Stars' shot had entered the net before, not after, the final buzzer sounded. The Habs were losing Game 7 of the Stanley Cup Finals, 2-0, when a Bobby Hull shot hit the crossbar behind Dryden. The rebound was passed up-ice to Jacques Lemaire for a long slap shot that beat Tony Esposito. Richard scored to tie the score late in the second period and again in the third period for the 3-2 victory. Dryden went 12-8 in the playoffs with a 3.00 goals-against average and was selected as the Conn Smythe Trophy winner over Beliveau, Richard, who had scored deciding goals throughout the playoffs and Frank Mahovlich, who set a Stanley Cup record with 14 goals and tied another with 27 points. His brother, Peter, was instrumental in blunting Esposito while Houle did a big job shutting down Chicago's Bobby Hull. "Hull got away from me for a second and took a big shot and I knew it was going in. I felt awful," Houle recalled. "We would have been down, 3-0, halfway through Game 7, but Jacques scored from between the red line and blue line and Henri got the next two goals. Ken made another stop on Jim Pappin that I will never forget, a key stop during that series. Pappin had an open net and Ken just put his leg out and stopped it. They were all over us at the time. It shows how important it is to have a good goalie who can keep his concentration and make big saves under tremendous pressure. He gave us a big lift." That one year was not the entirety of Dryden's illustrious career, merely the first NHL look at Dryden, previously a three-time college All American at Cornell. He led the Canadiens to another Stanley Cup in 1973, took a year off to complete his law degree and returned to help Montreal win four-straight Stanley Cups from 1976-79. Although Dryden didn't repeat as a Stanley Cup champion in 1972, he did win the Calder Memorial Trophy, the only player in North American professional sports to win his league's championship MVP trophy before winning its rookie of the year award. "The unfortunate part of 1971 was that Boston had previously held Dryden's rights," said Tom Johnson, who followed his Hockey Hall of Fame career with the Canadians and Bruins by coaching that 1971 Boston team. "We drafted him in 1964 and, for some reason, traded his rights that year for a couple of minor-league players. He wasn't all that successful earlier that year in the minors, but unfortunately for us, he caught fire at the right time. After that, he was one of the better goaltenders in the league over the years. He deserves this honor; his record speaks for itself." That record also includes five Vezina Trophies, five First NHL All-Star Team selections, one Second NHL All-Star Team selection and five NHL All-Star Game appearances. Dryden enjoyed the 1971 Stanley Cup, but treasures his memories of two other series that had a greater impact on the future of hockey, the 1972 Summit Series matching Canada against the Soviet Union and the 1976 Stanley Cup when the Canadiens unseated the two-time champion Philadelphia Flyers. "The most memorable time, and I think this is true for everyone involved, was the 1972 Summit Series," Dryden said. "Whether you were a big part or a bit player, it didn't matter. It was such a test, so hard, so disappointing at times, so exciting throughout, so much of everything tied together. You had to live with all those circumstances and feelings and try to find answers for them all. It was something of greater importance to Canadians than any other hockey series ever played. When you survive a hard time, you remember it." "The Stanley Cup I enjoyed the most was 1976," Dryden continued. "The Canadians had lost for the past two years and the Flyers had won for two years. We were starting to become a really good team again so it was another transition year. Our team was emerging into the team that won four Stanley Cups in a row. "From the time we lost to the Buffalo Sabres in the 1975 semis, from that point on, the next season had begun and we were chasing the Flyers. We played them in the preseason and beat them and beat them in the regular season. We pulled away from everybody in the regular season, but we knew the playoffs would be another story. We won and that was something we absolutely all did together from the previous summer. It felt like a mission and we accomplished it." Dryden was asked to address some of the issues from the 1976 Stanley Cup Finals which was viewed by many people as a match between brawn and skill and sportsmanship vs. thuggery. Asked if the Canadiens bought into the media view of the Flyers or saw them simply as opposing hockey players, Dryden didn't shy from the question. "We bought into both sides of it," he said. "We respected the Flyers and their grit and determination. They had special players in Bobby Clarke and Bernie Parent and many others. "At the same time, I hated the Flyers and the way they played. I thought it was a completely cynical style and what happened was that a lot of the non-championship teams tried to imitate the champs. There were more and more teams trying to be like the Flyers. "I thought what we did was really important," Dryden said. "Our effort was not only successful, it was necessary and that's also what made it feel so good."